George Nichols was born in Brattleboro, Vermont in 1856. 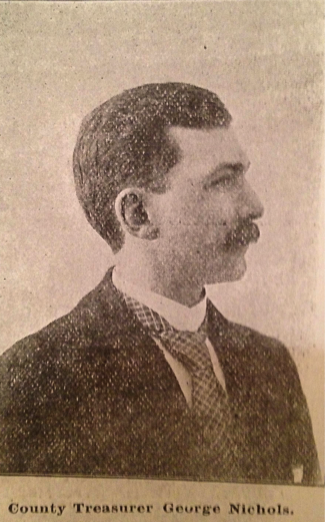 He moved to Marshal, Minnesota to work in a hotel, where he stayed until he moved to Fargo in 1878 and became a clerk at the Headquarters Hotel. Working behind the desk, he became popular with the people of Fargo and did his best to talk to every man who wandered into the hotel. After many years of working at the hotel, in 1885 he took the County Deputy Treasurer position. Nichols held the position for two terms, the maximum that a person can hold the position. This was proof of how very popular he was among the people of the city. This led him to be nominated for State Treasurer and the Fargo community was extremely excited and highly supportive of his election.